Curious - did it happen to coincide with you renewing your subscription or changing address? I've found the last two times I've renewed subscription off the new site the mag has disappeared for a couple of issues and I have to contact subs department to get it sorted. No, my sub had been renewed for 6 months and then this problem started. No address change either. I requested a replacement copy of #188, which was originally released at the end of November. It was sent on January 9th and arrived January 25th, a bit over two weeks later. Of note is that the replacement did not have the subscriber cover, just the normal issue. Today (January 28th) I received my subscriber copies of both #188 and #189. Very odd. Thanks for the info, as I'm hoping my original subscriber copy shows up, as that's one of the few sub copy covers I actually like. I was expecting the retail cover for my replacement, as that's always been the case in the past with replacements. So I asked before hand, if a subscriber cover couldn't be sent, it's been 2 months at this point, so please extend my subscription by one issue, and I'll just buy it locally. Of course they responded by saying the newsstand cover was being sent, and "thank you" and sorry for the problems. That was the final straw for me, as clearly no one read my request(as usual), so I asked to be put in touch with a supervisor so I could look in to canceling my subscription. So I finally heard back this morning with the option to extend my sub 2 issues, or to cancel, so I came hear to see if there was any news on issues #188/189 arriving to anyone, as #189 seemed missing as well at this point. My copies normally show up within 1-2 days of east coast subs, so I'll wait to see what happens. If 188 and 189 arrived together, the best I can guess is that since 188 shipped during the busy holiday season, it was sat someplace and wasn't moved until after the rush was over. In the US, USPS often puts "low" priority on lower option mail like bulk or media, as to make sure higher priority stuff arrives on time. This could be a thing at other shipping places throughout the world, as that's the only reason something should arrive so far after the fact. I had a package arrive within the US during the holidays a few years back almost 2 months late. Of course I just bought the retail copy of #188 yesterday, as I didn't want to miss out on that issue, as my replacements ALWAYS come beat to s**t each and every time. So of course my original issue will probably arrive today, since I just bought the issue, but this is what happens when dealing with such a poor operation. This is a special issue, so if need be, I can probably sell my retail copy for what was paid, but if my sub copy does arrive, it may be beat up after 2 months in shipping, so I may need it after-all. So if all issues arrive OK, I guess I'll stay on board, as it's doubtful I'll get back much in regards to a refund for non shipped issues. If that happens, I'll for sure not be renewing again this year, as this has just become to much work in regards to any and all problems. And the lack of care or any regular appearances in these forums says it all in regards to Future and them wanting to provide any kind of proper CS. I guess all good things come to an end. So to further the story, I received my subscriber copy of 188 yesterday and replacement 188 and subscriber 189 today in Mississippi. Very weird, but at least, it seems that we subscribers in the US are experiencing similar stories. I can at least eliminate any potential issues with my local postal service. Yeah, nothing for me yesterday, but I'm near the west coast, so it normally takes a few days for me to get anything past the midwest or east coast subscribers. No chance my replacement arrives this soon, as it just shipped, but it would be cool to get 188 & 189 at the same time. I was really bummed when 188 went missing, as it has one of the few subscriber covers I like. Now I just hope that if it does finally arrive, it's not beat to hell and back. I'll report back as soon as something shows up, as I'm missing a few issues at this point. Another Thursday, another issue as #190 popped. Kinda early compared to the last one? Well, #188 & 189 arrived today, and #188 is in just about the best shape of any issue I've received in the last year. I don't know where it's been for almost 2 months,but glad to see it arrived safe and sound, as it's also one of the best subscriber covers as well. I remain fascinated that Norway is always receiving subscription copies lightning-fast compared to the rest of Europe (and the world). For comparison, issue #189 might have taken longer there as usual with around two weeks instead of one, but for Germany it took five weeks instead of the previously three. And that's with (based on the adress stickers) routing now going trhough Germany instead of Hungary, which clearly hasn't improved delivery times at all. I finally received replacement issues for #187,and #188. 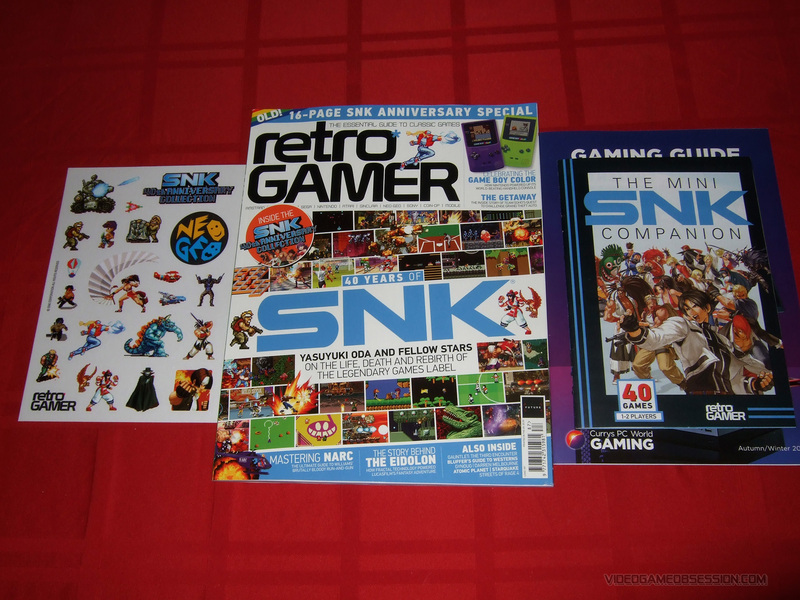 Sadly the SNK issue was not the subscriber issue. This was probably the only subscriber cover I cared about owning. In fact if anyone has the subscriber issue and wants to trade for a retail copy please let know! Also, does anyone know of a deal to re-subscribe to RG for around $60USD? I used to resub each year by using the code CLASSIC, but since Future took over they removed the ability to do this. I can't swing the $100+ they are asking of me. To my knowledge, that "CLASSIC" code died when Future took over. The best deal I've gotten has been about $90-$100 if memory serves correctly, and that's the deals I get in the mail near the end of my subscriptions(or email offer). Whatever the price was, it came out to about $8 or $9 per issue, which was still pretty good compared to Barnes & Noble. But now dealing with these headaches, and lack of any proper customer service, it's just not worth it anymore. So when my current sub is up, unless they offer some super deal like the "CLASSIC" again, I don't see renewing again. I'll just buy my issues locally and pay the premium, because at least then, I'll know that my issues won't be lost, damaged, etc. And yeah, when you get replacements, they are always the retail copies, as once the subscriber copies go out, they are gone. This was another tipping point, as I rarely like these subscriber covers either, and then when you may actually want it, it can't be replaced. So we got no choice in getting that cover to begin with, and then on the rare occasion one is good, you may miss out due to no extras being offered or available. Just really janky service, with no signs of getting better. Oh hey - today the new issue of Edge dropped in my mailbox, just 6 days after the store date. HOW is it possible that Edge ALWAYS gets delivered significantly faster and WHY can't Future manage to work that out for Retro Gamer as well? I recall when someone from Retro Gamer last showed up in this thread (which seems ages, sorry... "only" months ago) they said that all magazines get sent the same way, which simply hasn't been true then and now. Last edited by NorthWay on Sat Feb 09, 2019 4:34 pm, edited 1 time in total. I just got a letter with an offer to resubscribe. But the offer had expired before I even got the letter.